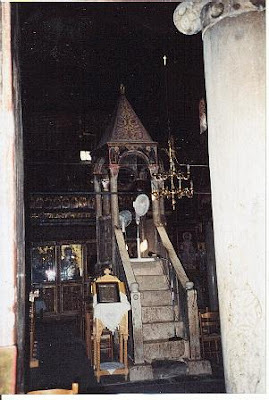 Since my youth I have had a special admiration and love for stylite saints, especially St. Symeon the Stylite. 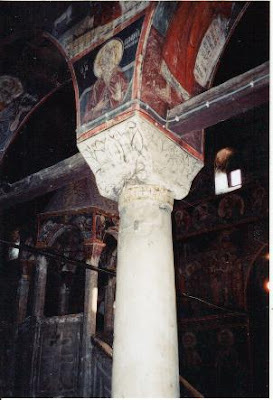 I spent many a moment in my younger Christian days contemplating the life of St. Symeon and his astonishing feat of living atop a high pillar continuously decade after decade while exposed to all the elements of the air and temptations of the demons. I can't say I ever wanted to emulate him though. Regrettably it is a lifestyle beyond my strength. I always wondered what reaction people in contemporary Europe or the United States would have if stylites lived among us. I think the closest example of a reaction to something like this was when magician David Blaine did his Vertigo stunt in May 2002 when he stood atop a 100-foot pillar for 35 hours to imitate, as he said, the life of St. Symeon the Stylite. As with all of his stunts it drew national media attention and large crowds gathered to witness the astonishing event in New York City. Recently I witnessed one of his stunts in person in Central Park, and over a three day period people were coming in streams to see him. 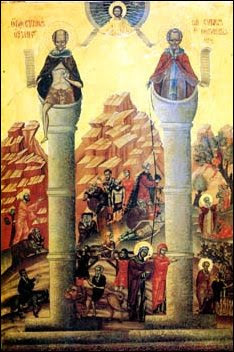 But if a person today lived atop a pillar for 37 years like St. Symeon they would probably either think he was crazy or was just performing an extreme religious stunt. 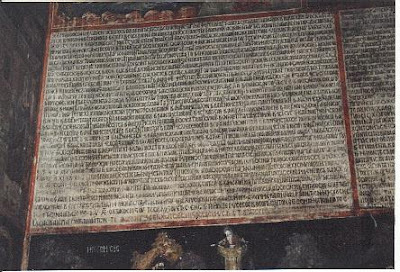 Yet if miracles followed, as in the case of St. Symeon, then we may have a different story. 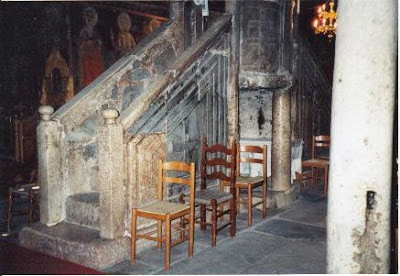 For me, one sign of a healthy church is if it produces stylite-type ascetics, or at least publicly honors such stylites and encourages a type of imitation that is as much sacrificial.. A church that doesn't inspire and produce such asceticism is far from maturity and it would be our biggest folly to think otherwise. 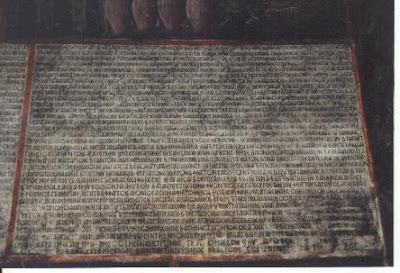 Not to sound like an idealist, but how inspiring would it be to walk out of your local parish to see a stylite, or to be able to get into your car and make a pilgrimage to hear the wise counsel of a man or woman suspended between heaven and earth to escape human glory and focus on glorifying God? What an inner conviction this would inspire! What a model of virtue to emulate! What an example to live up to! These days I am much more of a realist by necessity and for sanity's sake. It is a rare feat for anyone to even keep all of the prescribed fasts of the Church in our contemporary ecclesiastical atmosphere, and this in a day and age when it should be much more easier than ever with all that we have available to us. Keeping this in mind, how dare I even entertain the hope of America producing a stylite-type ascetic. 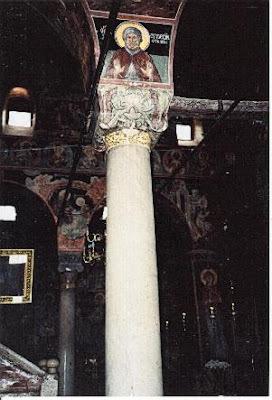 In America we are fortunate if we can even get a glimpse of an icon depicting a stylite saint in one of our parishes proudly displayed so as to inspire possible emulation of either the same feat or a type thereof. I'm pretty sure it exists somewhere, but I've never seen one. Someone may wonder where my thoughts about these things come from. 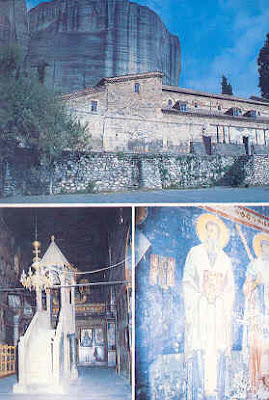 Though it goes back many years to when I first read the life of St. Symeon in High School and was fascinated by it, these specific thoughts stem from a pilgrimage I made to Kalambaka, Greece in the summer of 2001. 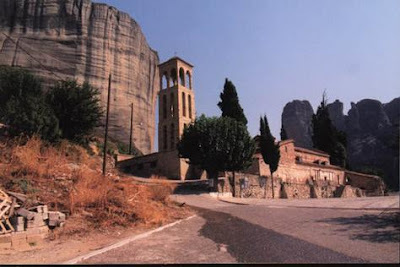 At the foot of the Meteora monasteries is a medium sized church dedicated to the Dormition of the Theotokos. 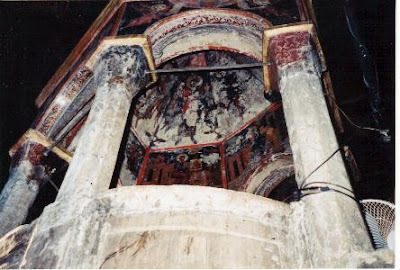 This church dates to about the 11th century, though it was built atop a previous church structure dating back to approximately the 5th or 6th century. 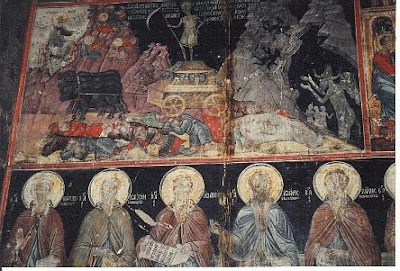 The iconography dates back to the 12th century, many of which were done by Neophytos the Iconographer, the son of the Cretan Theophanis Bathas-Strelitzas who did much of the brilliant iconography in the monasteries of Meteora. 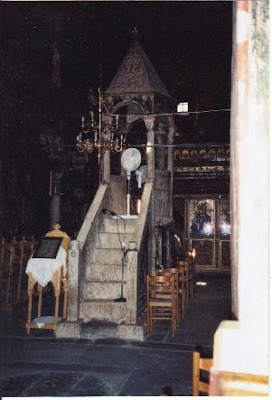 The focal point of the church is the very rare solid marble pulpit (I've been told it is the only one in Greece) that stands right in the middle of the church as it was done in earlier centuries. 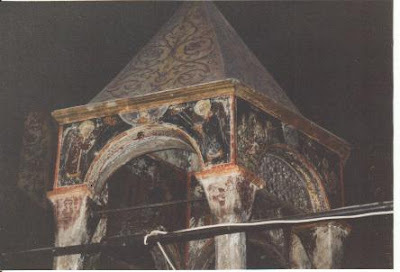 Another focal point (not open for viewing to the public) is a crypt behind the altar which was used as a hiding place during Ottoman times. Though everything about this church was overwhelmingly fascinating to me, what especially struck me were the pillars that held up the entire structure of the church. 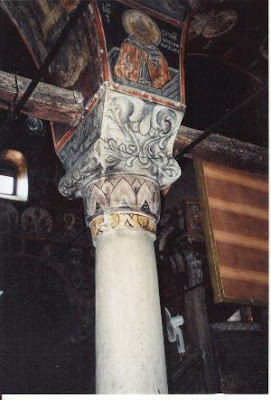 These pillars were fashioned in the style of the stylite pillars depicted in icons of the stylite saints, and on each of the four sides of each pillar throughout the church was an icon depicting a stylite saint; so that on one side of the pillar you may have St. Symeon the Elder while on the opposite side you have St. Symeon the Younger and next to them on each side would be St. Alypios and St. Daniel the Stylites. 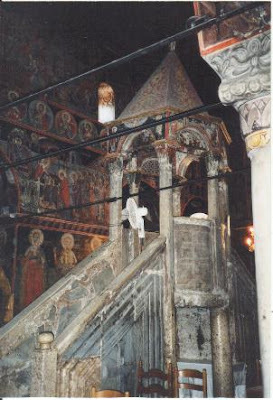 The image literally left me drop-jawed and in awe, and all I could think of was celebrating a Divine Liturgy in this church, which gives you the impression that you are worshipping in the midst of a few dozen or so stylite saints. It was an overwhelming experience that I would love to see in a parish near where I live in Boston, and it has always been my dream to transplant that experience I had in a church dedicated to the stylite saints in America. 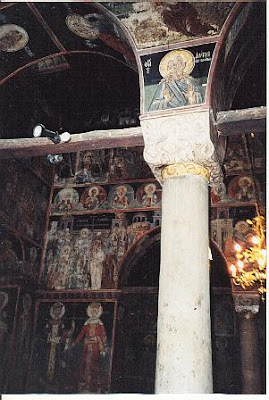 Thus, just as the pillars in the Church of the Dormition in Kalambaka, the Church year also is held up and made sturdy by the endurance and faith of the stylites who literally became like bodiless angels in their quest for personal healing and salvation, and in turn they inspired the same in countless others. 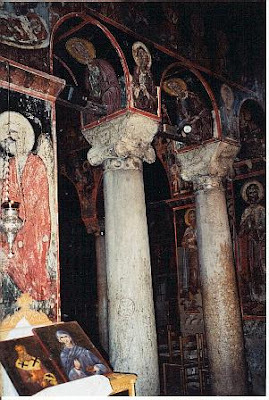 Below are some photos I took in the Church of the Dormition of the Theotokos in Kalambaka, Greece.